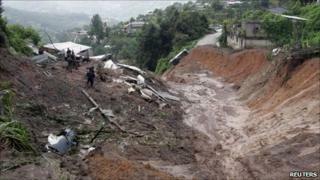 Mexican officials have dramatically scaled back the number of people believed buried by a landslide in a remote southern town. After rescuers reached Santa Maria Tlahuitoltepec in Oaxaca, officials said 11 people were missing. Local authorities originally said a collapsed hillside had engulfed hundreds of houses, raising fears of many deaths. The region has seen weeks of heavy rain, and mudslides remain a risk. Reports suggested the number of victims could be as high as 1,000. But when rescue teams managed to get to the town, high in the Sierra Juarez mountain range, they discovered only several homes appeared to have been destroyed. Speaking in Oaxaca City, the state governor, Ulises Ruiz, said 11 people were missing - eight children and three adults. A local official in the town, Cipriano Gomez, told the BBC that the town was in a state of chaos. "There is no electricity, it is still raining heavily," he said. Mr Gomez said that the authorities had decided to evacuate the town of 9,000 because there was a risk of further landslides. The landslide hit the town at 0400 local time (0900 GMT) on Tuesday, when most of the residents were sleeping. Santa Maria Tlahuitoltepec is famous for its colonial buildings and archaeological sites. The BBC's Julian Miglierini in Mexico City says the area is the heartland of the indigenous Mixe culture and is considered one of Mexico's poorest. Parts of Mexico, including Oaxaca, have endured their worst rainy season on record. Heavy flooding and mudslides have forced thousands from their homes.